This happened to me a week ago: I go to train some troops, and look before queing at the training times: it was something in the order of 10 minutes. I remembered that I needed to put my hero in the training job, so I did. He was level 65 at the time, so, I expected something around a 30% decrease in training time. I’ve never been so wrong in my life…. The two key words here are additive and speed (vs time). Additive means that multiple bonuses to whatever process in game simply add up, instead of multiply. So if you take a base value of 100 (of whatever) and have two bonuses, one of 40% and one of 60%, multiplicative would mean the net total would be 100*1.4*1.6 = 224, while additive would yield only 200 (100+40+60). This is the first step in coming to the right solution. The second key word means that whatever bonuses apply to a certain process, they apply to the process speed, and NOT the process time! So a bonus to troop training means training speed instead of training time. For a given process, each consecutive bonus will be less effective. As you can see, in both instances we receive a one hundred percent bonus to process speed, but in situation 1 this reduced the process time by 50/100 = 50%, while in situation 2 it only reduced the time by 16.6/50 = 33%!!! Clearly, the same bonus seems to pay off less if other bonuses are already in place. Now for your convenience, I have graphed the bonuses (in percents) you will get, against other bonuses already in play. The X-axis is the bonus you receive last and want to know the effect of. The Y-axis shows the actual decrease in time that bonus will net you, based on other bonuses. The different lines represent different amounts of other bonuses you already have, which I limited to 100% max. If we take the example I gave above we can learn how to read it. In situation 1, we get a 100% increase in speed. So on the X-axis, we go to 100%, on the far right. At that moment, we didnt have any other bonuses, so we look up the graph for 0% extra bonuses. This turns out to be the top blue line (look it up in the legend). 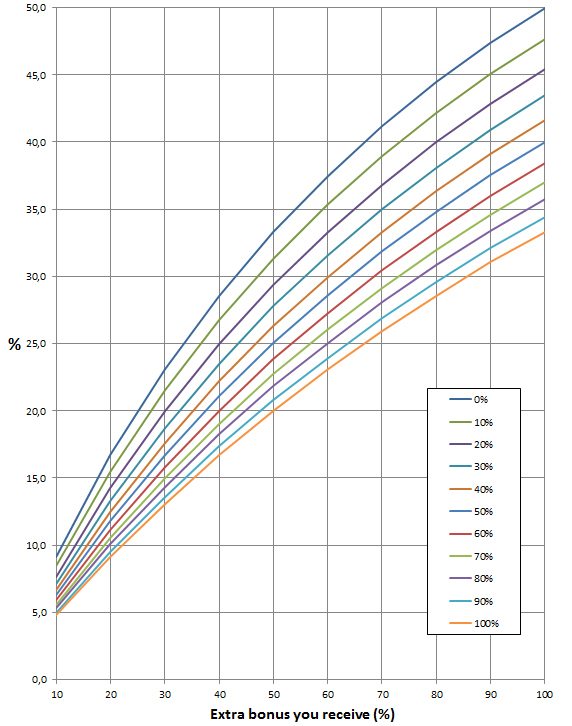 We can now see that the 100% speed bonus results in 50% time reduction for that process, as we calculated. For situation 2, we start the same: We get 100% bonus and look it up on the X-axis. However because we now already have 100% bonus, we must look up the correct graph/line. From the legend, this is the bottom orange one. And now we see, as calculated again, that this additional 100% only yields a 33% decrease in time. Conversely, we can also do this the other way around. Remember my opening paragraph, where I had a lvl 65 hero aide in a troop training. At 0.5% bonus per level, this yields a 32.5% bonus in troop training speed. Lets make it 30% for now. As I told you, eventually the bonus to training time turned out around 13%. Now what we have to do is look for 30% on the X-axis again. We then move up to 13% on the Y-axis, and voila, we find the number of other bonuses already in play for troop training. Turns out to be 100%! I knew that I had lvl 5 Siege Weapons researched, which yielded the first 50%, but I couldn’t figure out the remaining 50%. Eventually, I found out that the Stables, Armory and Forge also add a 10% bonus per level! Note that is deceptive and poorly commented in-game; only for the stables the description says “allows faster training of mounted units”, but from experiment, the Armory and Forge add bonuses to Foot and Ranged troops, though I am not sure which covers which (Wrong I found out; Only Forge adds 10%…see post on Training times). And as all those buildings were at lvl 5 as well, I found my missing 50%. Now, this information may not be particularly helpful in practical terms, but it was fun for me to figure out and perhaps it will help some of you to better understand the underlying game mechanics! Cheers! This entry was posted in Articles, Blog, City building, War and troops and tagged bonus, diminishing returns, Hero, kingdoms of middle earth, Speed, training, training time, troop by beardmonkey. Bookmark the permalink.